As we predicted, but not as From Software planned, the countdown clock that launched last week gets its reveal in this week's Famitsu — on newsstands this Friday, leaked on the internet right now. 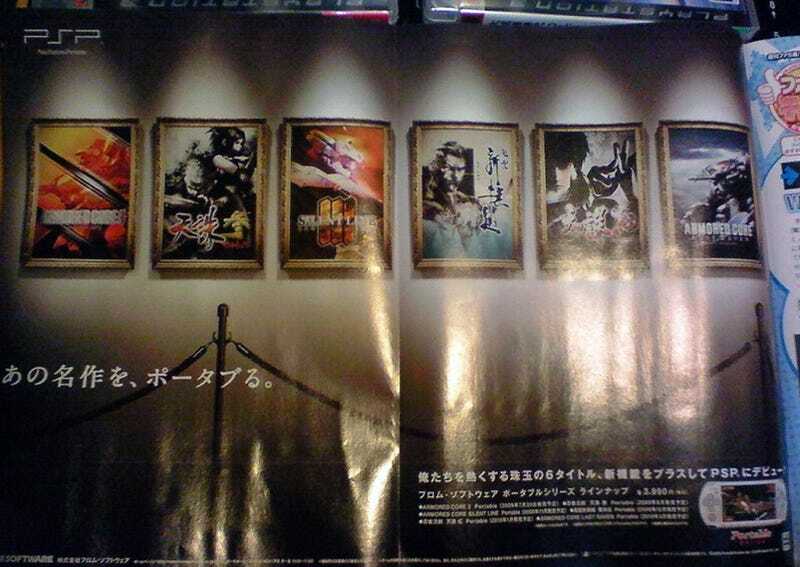 From Software is releasing a slew of PSP ports of PlayStation 2 game, and they are largely, you'll never guess, giant mecha Armored Core and stealth Tenchu games. SHOCKING! The games are Armored Core 3 Portable (out July 30), Armored Core: Last Raven (out March 2010), Armored Core: Silent Line Portable (out November), Tenchu: Wrath of Heaven (out August) and Tenchu: Fatal Shadows (out January 2010). There is one one curve ball — a genuine surprise, even. From Software is porting PS2 game Fu-un Shinsengumi to the PSP. Originally published by Konami, the game was developed by Genki and features artwork by Metal Gear Solid artist Yoji Shinkawa. Not sure how From Software came into possession of this title, though. From Software should have a countdown clock to that.